For all the sailing couples out there... A new series of stories told from two sides: his and hers! It's all part of my 'No-Drama Sailing' collection. We'd love to hear comments from the sailor in your family (male or female) and -- perhaps more importantly -- from the sailing spouse. Please leave your comments below! So it was finally here: Spring 2012. And what a spring it had been. The warmest on record. Perfect sailing weather. But the Blue Moon had been stuck at the dock with all her spars and sails out of her. I'd had a good plan for a normal winter: redo all her running rigging so she'd be strong and easy to sail. It was a plan I'd been working on for over a year -- since returning from my long voyage home. And now I was done. I'd added powerful reefing gear to the main; figured out how to rig the mizzen so it would be easy to raise and lower; and I'd rebuilt her boomkin so it didn't interfere with tilting the outboard out of the water. Fantastic! I'd replace old halyards, figured out a way to set my flying jib without flying overboard, even learned how to set the topsail, which probably hadn't been set by several past owners. In short, the Blue Moon was ready for spring and I was raring to take my darling Helena out sailing. Now Helena is insanely busy. She's a very popular piano teacher with over 60 weekly students. 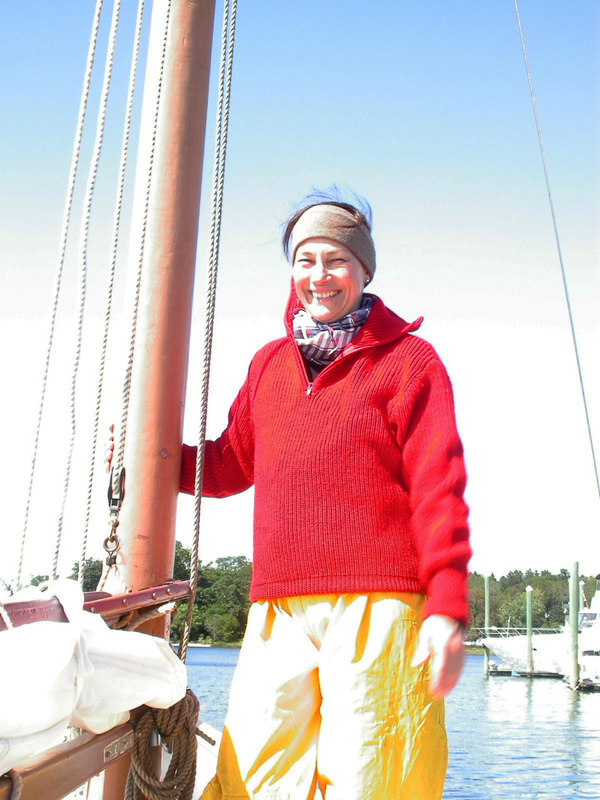 Plus she's an avid gardener and the spring had been just as good for gardening as for sailing. So I didn't push her. I had plenty of things to work on, including planning the refit of the Blue Moon's cabin to make it a bit more wife-friendly. We planned to sail out east in the fall, and I wanted the boat to be cozy and comfortable for my favorite woman. But eventually, Helena's busyness started to seem like reluctance. And that raised a big red flag for me. I know a lot about women and boats. My father and uncle were sailors. As a kid, I watched my mother and aunt slowly detach themselves from sailing, until it became an all male thing. My mother, in particular, became very boat-shy, and I thought I knew why. Though my father loved sailing, I think even he would admit he wasn't very good at it. Women like to feel they're in good hands. In safe hands. With my father at the wheel, no one was safe. When the going got rough -- as it did, occasionally -- my father fell apart. He panicked. He yelled. He looked scared. My mom took the only reasonable action, under the circumstances. She refused to step foot on a boat ever again. Any boat. Unfortunately, this is an all-to-common problem. I'm pretty sure it's the reason there weren't many women sailors in the Age of Sail. Lousy food; worse sleeping quarters; and the French or Spanish always shooting at you. "How can you call that fun?" I can just hear my female ancestors ask their sail-crazy male relations. But Helena was different. Helena is athletic. She relishes hard, dirty work, like sanding decks. She loves to travel. In short, she's the kind of woman who's ready for anything. Even going up the mast. I'm far too much a gentleman to ever suggest a lady ascend a mast, particularly in my somewhat rickety home-made bo'sun's chair. But after watching me go up, Helena's reaction was "That looks like fun. Can I try?" And I'm different. I might not be an expert on wooden boats, but I am an expert on women. Or at least Helena. I've always been careful not to scare her on the boat. Never take her out when there's more than a 10-15 knot wind blowing (the Blue Moon is a heavy-displacement gaffer, so this is a mild breeze for her.) I know that just one scare can put a woman off sailing for life. I've seen it with my own eyes. Not going to do it! "It's probably just a scheduling problem," I thought. "We just need to set aside some time. Easy-peasy." So the next morning, I cornered Helena in the kitchen, having coffee, and broached the subject. "Hey, I was thinking we should set aside a couple mornings a week for sailing," I said, brightly. "M'mmmm, yeah," she said. "Wait. You don't mean this week?" "Yes, what mornings do you have free?" "Not sure, exactly... I've got quite a bit on..."
"Because you know how you're always saying, 'we just need to make time', to fit things in?" "That's what we need to do. Set aside maybe two mornings a week to go sailing. Otherwise, things happen, we never get the time, yada-yada-yada..."
"What about Tuesdays and Thursdays?" "John, I don't like sailing." Well, that stopped me for a moment, I can tell you. "Is this about that one sail last fall?" I asked. "Because you know that was just to give Nick a thrill." Nick is our son, and I had reefed just a bit too late on a blustery day last fall, and a 15 knot gust had put the rail in the water for a second, and the fear of God in 6'4" Nick's green eyes. Helena hadn't said a word at the time, and I was proud a little heeling hadn't scared her. I paused and said, "It was just for fun." "I don't like that kind of fun." "We were in no danger. The Blue Moon can take a lot more than 15 knots of wind. It's not like there were whitecaps or anything." "It's scary for me," she said. "I don't like it." Not like it? What could she possibly mean? I must admit I was befuddled at that moment, but then I had an idea. A real brainwave. "I know what you need," I said. "Sailing lessons," I said, proudly. "That's what you need." "I've been thinking about this for a long time, and know just how to do it. It will be great." "I'm not really good with that sort of thing..."
"And you know, a wife who knows how to sail is the best insurance a sailor can have. If I fall overboard, you can turn back and rescue me. That's super important." I could see the thought had never crossed her mind. She had that much faith in my sailing abilities. "Sailing lessons start tomorrow!" I said. Spring is finally here! Not that we missed the warm weather much. This winter was very warm and John and I kept busy with our favorite hobbies: I practiced on my piano, while John worked on something in the basement. Exactly what, I didn’t quite understand. Yay! Time to start working in the garden, plan the new vegetable beds, go to nurseries, sow and transplant, prune and weed. John is still running back and forth to the boat, trying to make us (me and her) both happy. With the spring comes the wind, with the wind, the sailing, with the sailing the hesitant but ever present question: Would you like to go for a sail? Go out for a sail? Wait. Zzzzzzzzzzzip - rewind. Last summer, we did quite a bit of sailing on the Blue Moon. I loved working on the boat, but John knew I didn’t have much sailing experience: Once, as a teenager in Brazil, I’d been on a small catamaran. It capsized. Another time, I went sailing on a big boat with some friends. We got stuck on a sandbar. Being in situations where I have no idea of what to do, scares me. Now, John is a sensitive man and a fine sailor, so his approach was very gentle. Gradually, over the course of the summer, he tried to convince me that sailing is not so scary. But despite his care and skill, several escapades shook my confidence. Two examples. Sailing escapade one: my very first sail on the Blue Moon. It’s a drizzly spring day. To make sure I stay dry, John suggests I put on some foul gear. Have you ever put some on? Oh my. I couldn’t move very comfortably. The cold plastic lining made me cold, so I put on some cashmere sweaters to warm up, but then I looked like a big yellow buoy, just to keep with the nautical theme. Did I mention it was bright neon yellow? Oh yes. “It is that color because if you fall overboard it’s easy to find you,” John said. Nice. Once we got out of the channel, and into the bay, John lovingly mentioned that we should go over some safety procedures, like they do in the cruise liners. OK, I think. So when he goes overboard, now I have to look for some cushion or life jacket to throw after him. In the meantime, this boat is heading out to sea without a captain, or anyone who has any idea about how to stop it, or steer it. But once I throw the cushions and lifejackets overboard, don’t I have to go back and find him? “No problem. The boat will stop by itself, because it will turn itself into the wind if you just let go of the tiller,” he says. Or something like that. I didn’t really understand how it would work. But I get that I don’t have to worry about the boat sailing off to Greenland by itself. It will stop. Good. Radio? Flapping sails, swinging boat and boom? I don’t know how to use the radio! After the preliminary safety instructions, unlike on the big cruise liners, where we all go down and have some Margaritas, we on the Blue Moon continued our journey into open water. I was ready to go back to the dock by then. I was exhausted. But that rainy day turned out not only rainy, but windy. John was thrilled!! It was our lucky day. “First time out and we get perfect wind,” he said. The wave were a bit too big for me, even though I didn’t have to sail. Wait! Actually, I couldn’t have sailed, even if I wanted to. I was holding on to the sides of the boat with both hands, just so I didn’t slip off, and my feet were stuck against whatever surface they could get a grip on. John was so excited with the sailing, that he didn’t notice the fear that was taking over me. The water gushed into the boat through something John called ‘the scuppers’ because we were slanted, and the waves were so big that water also sprayed over the front. I was glad to be wearing that horrible foul weather gear, but all I could do is rehearse in my mind the “man overboard” steps. The more I thought about it the more afraid I was; the more afraid I was, the more I didn’t like sailing. I don’t like this sport, I thought. It’s not for me, and I don’t think any of my friends would like it, either. We made it back. I was dry and John did not fall overboard. Euff! I will take that Margarita now. On the way home, John was very excited. The sailing was great and he couldn’t wait to go on the next one. He kept reassuring me that once I learn how to sail, I wouldn’t be afraid anymore. It would be real fun. Oh boy. Sail escapade two: our 6’4” son Nick was visiting for a fall weekend. He had taken some sailing lessons and was excited to come out with us. I try to convince John that this would be a great opportunity for some male bonding, and that the two of them should go and have manly-man times together. Fail. Here I am on the boat again. John promised it would be really nice and relaxing. I fell for it. The wind picks up, the white caps are everywhere and I can tell John wants to give Nicholas a real taste of what sailing is about. He puts Nicholas at the helm and goes to put some more sails up. Water gushes through the scuppers; I am holding onto everything (again); I don’t want my son to see me cry so we keep going. Back onto the land, I promised myself I would never set a foot on a boat, ever again. We went out a couple more times. I can’t remember them very well, either because I decided to drink those Margaritas before sailing or my memory mercifully blocks it out. So, that was last summer, and now spring is here, again! John is making plans and asking me to go sailing. I must get the courage to tell him about my fear of sailing, about the pain of having my nails gripping the wood, the constant mental stress that something bad is going to happen. Did I mention the boat has no bathroom? OK, so I have been making excuses, I have been busy, but I have to tell him the truth. He looks at me as if I just told him I was having an affair. One sail? How about all of them? While I am trying to come up with words that will explain without hurting, John has an idea. I can see it in his eyes. “Sailing lessons!” he says. “That’s what you need. He explains to me that once I knew how to sail, I’d feel more in control, and wouldn’t be so frightened. He almost has me convinced, when he mentions something about falling overboard, again. I will agree to the sailing lessons, I think. But John will learn a few things too, this summer: about women. “Sailing lessons start tomorrow,” I say. I'm not sure how it is possible but I think we are married to the same woman. I think you have hit on a unversal truth. Men are from Sea, Women from Land? Keen to see how this runs out. My significant other has had one boating experience farther away from shore than a dog-paddle to safety. It ended with rescue by the Coast guard. Looking for good tips!!! Lucky for me, Helena has a sense of humor. Isn't bronze the new gold? 18 year old blond... I think I've got one of those around... Yes, daughter! That might work! Good luck with the sailing lessons. I am dubious about how well that will play out, but the lady surely can express herself well! Thanks! I'm allowed to brag on my wife, so I'll point out that Helena is Brazilian, so English is not her native tongue... She manages to let me know what she thinks, though. Been sailing for many moons. I have a GF who had never sailed until she met me. But this year, after many hours of discussion, theory and lessons in fluid dynamics, we began some serious passages ....with high winds and accompanying seas. (Force 9 and 4 meter waves) Two such passages so far complete with rails in the water and a cockpit full of sea water, life vests worn and everyone clipped to a jackstay or hard point. She enjoyed the experience thoroughly but she understands the facts about safety aboard. She can initiate and control a MOB drill because she understands the manoeuvre is a life or death scenario especially in rough conditions. She also knows to let the boat round up during a gust... she also gives me the gears for not reefing early enough... she is getting there! It took some time before I broke through all her objections. I won her over when I agreed to have a second well qualified crew member aboard, for night and multi day passages. We are now getting serious miles under Pegasus V keel! Biggest benefit?? She has overcome her seasickness. Wish I could post a pic of her in oil skins... Helena would laugh too. Hilarious. 'seas' we get around here. Really John - Helena's "notion." I'll be at the show fri & sat. Hello, I stumbled on you blog about an hour ago. I was meant te be asleep but couldn't stop reading it! The concept of looking at two sides of a sailing story through the eyes of spouses is excellent! I've sailed with my other half but before we were going out. I sail for a living so hardly ever get the time to take her on to the high seas. Anyway's from one sailing blogger to another. Thank you for such a great read.